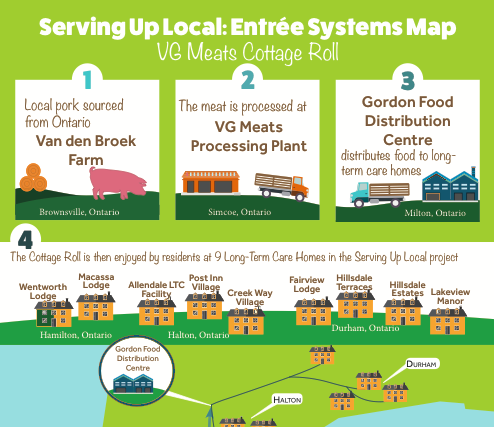 The Golden Horseshoe Food and Farming Alliance (GHFFA) project, Serving Up Local, is a partnership with Durham and Halton regions, and the City of Hamilton, to increase the amount of local foods offered in their facilities with a special focus on long-term care homes. 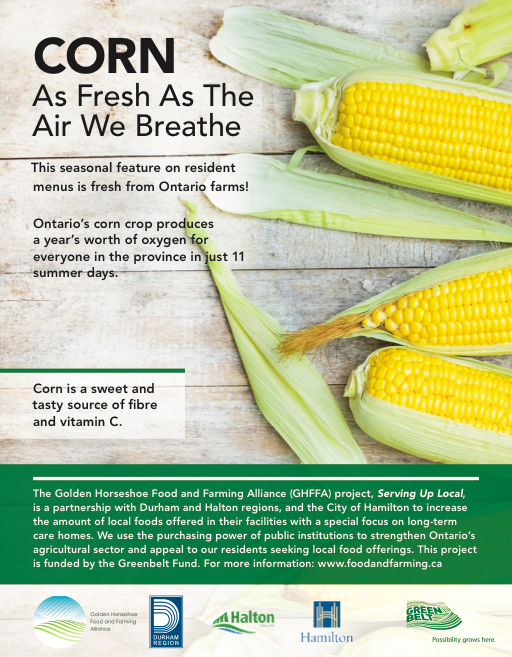 With an estimated $745 million dollars spent by Ontario’s Broader Public Sector institutions annually on food and beverages, we are using the purchasing power of public institutions to help strengthen Ontario’s agricultural sector, while appealing to customers and long-term care residents seeking local food offerings. Serving Up Local is made possible with financial support from the Government of Ontario, in partnership with the Greenbelt Fund. » Increase the amount of local food produce and food products homes and facilities are currently purchasing by 5% from their baseline. » Gain an understanding of the opportunities in long-term care to incorporate local food into resident menu offerings. » Influence contractual language around food procurement to incorporate local food targets and values into Requests for Proposals (RFPs). » Create new opportunities for local producers to supply long-term care homes and municipalities with quality Ontario products. ◦ You can view all of our Serving Up Local Posters here that are found in our partner LTC homes — if you’re interested in one for your facility, please get in touch with us. ◦ If you’re looking for more information on how to initiate a local food procurement project in your institution, check out our action flow chart. Determined current local food ordering – Through velocity reports provided by their current food service provider, each home determined what percentage and volumes of local food they were purchasing when the project began. Additional velocity reports were requested at the end of the project to determine difference in purchasing patterns. Identified areas where local food products could be substituted into current menu offerings – Many contracted product categories had local product options that fulfilled Group Purchasing Organization (GPO) membership obligations and could be ordered by the homes. These were identified to food service Directors through velocity report analysis and substitution documents. Opportunities found in GPO vendor contract for new local food producers – By better understanding the contractual obligations and opportunities in the GPO category contracts, we were able to identify opportunities for new products to be considered and analyzed for purchase. For instance, all of our homes were without contract obligations in the raw protein category. We were therefore able to introduce our teams to new raw protein farmer and vendor options to consider for implementation. Understanding the true cost of choosing local – Cost comparisons templates were created and used to compare local products and their alternatives to understand how choosing local would actually affect the facility’s budgets. 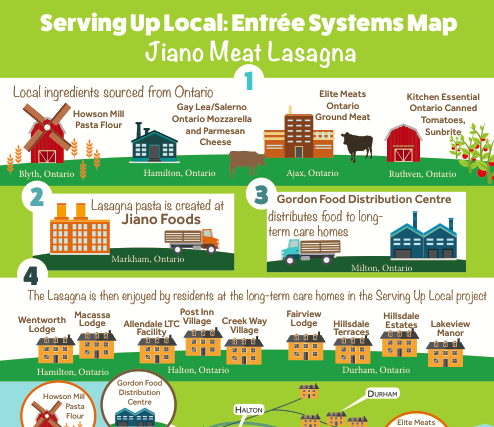 Developing new menus that feature more local, seasonal foods options – With a full understanding of the options and costs of new local products, menus were designed and workshopped around the new local substitutions and opportunities. Engaging residents, families and staff in new menu options – Engaging communication pieces and one-on-one conversations were created and carried out to demonstrate new local food menu choices to residents, resident families and facility staff. Influencing public policy and food contracts for BPS facilities – Through consultation with project staff and peer review, new RFPs for both long-term care and municipal cafeterias were written and included local food targets and values in the evaluative criteria. Share our stories – Through the sharing of project case studies, a good practices manual, our communication pieces and public presentations, we aim to inspire others while providing examples of actions that were successful in our project. 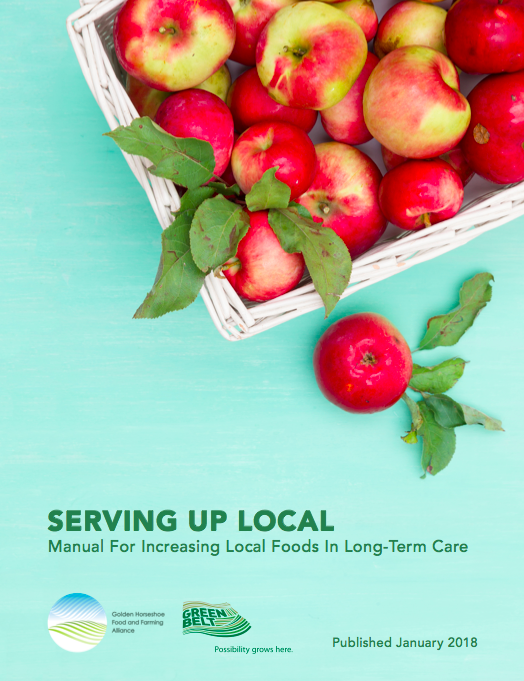 In order to deepen the work of the Serving Up Local project and respond to LTC residents’ interest in local food, GHFFA and Halton Region developed the Serving Up Local Training initiative. 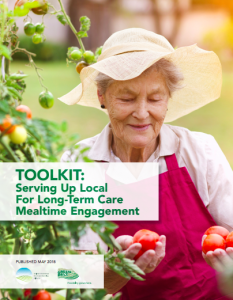 This project piloted local food literacy at mealtimes and enhanced the person-centered approach during meals served in long-term care by using the topic of local food. Check out our recently-released toolkit and animated video below — please feel free to share!